Share the post "The First & Longest Day"
Perhaps I’ve perfected the runaway feelings of want in that I hold on to the throttle to make sure a bit of time has lapsed before moving forward with a purchase. Too much of the time people get pulled into the hype of buying. Sales pitches are becoming more sophisticated and new releases of bigger and better are getting more frequent. I’m not so sure in this time that it’s consumerism that’s driving the public, but possibly the public mentality that’s driving consumerism. I’m not saying we should live spartan lives somewhere out in the sticks with nothing more than the bare necessities, but rather to live our lives based on real and lasting priorities. The nurturing of ones mind, body and spirit should come first, followed by family and community. What one’s neighbor has or doesn’t have in comparison to our general happiness should not ever be considered a factor in the equation of what happiness is all about. Surrounding ourselves with dead things oft times diminishes the importance of living things and attitudes begin changing for the worse. As it’s been said many times, “Money cannot buy happiness.” One very intelligent colleague once told me a number of years ago, “Money should never ever be considered an end—it is only a tool with which one can make work for ourselves and our community.” Likely because over these long years of selling homes, I remember far too many bitter old people with mounds of cash wishing near their end that they’d done many things differently. I took an hour or so walking around Big Blue and East Park today taking photos of some of the people, places and things. 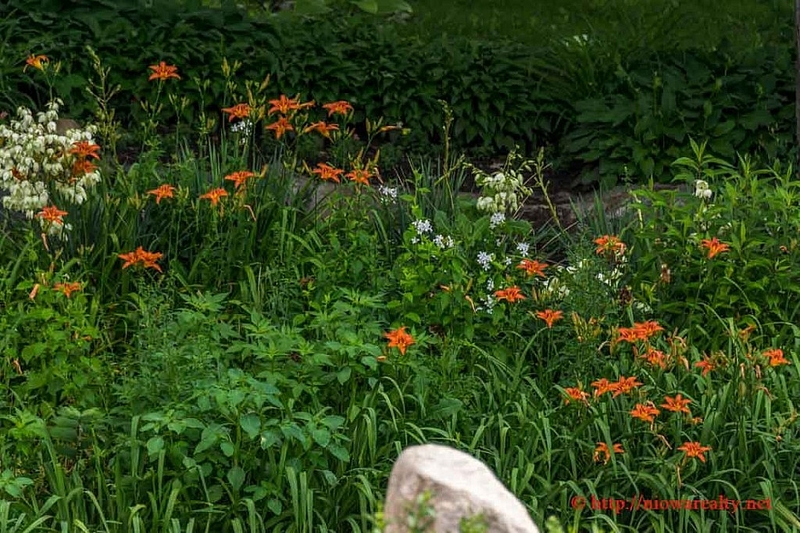 The above photo is of a clump of Day Lilies in East Park. There were a few fishermen out, and one of them was reeling something in that looked pretty big. Europeans do more walking around on Sundays where we Americans are habitual Sunday drivers. All I can say is for everyone to slow down a bit and enjoy the beautiful outdoors. Today is the first day of summer and the longest day of the year. Enjoy your short Sunday evening to its fullest tonight.